Do you love spicy food? If you do, you will love this Sriracha Grilled Zucchini. It is an easy 3 ingredients Sriracha recipe that is spicy and flavorful. 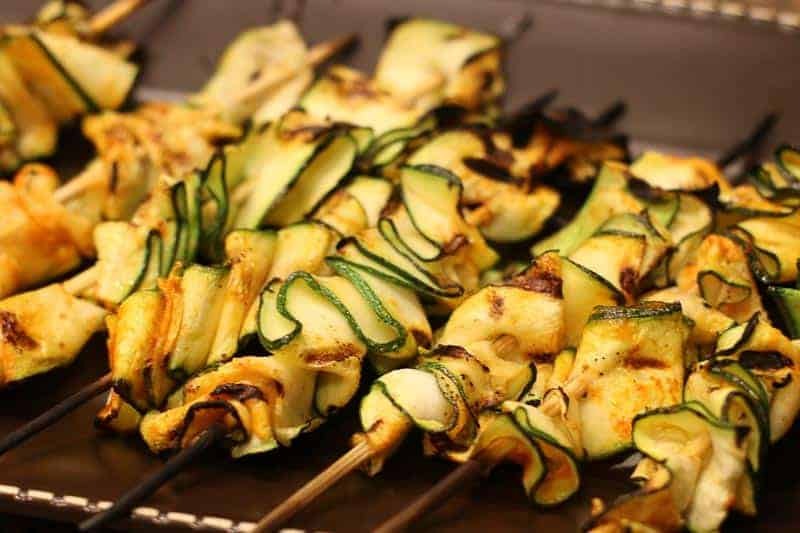 You can serve these grilled zucchini ribbons on a stick as an appetizer or a side dish. 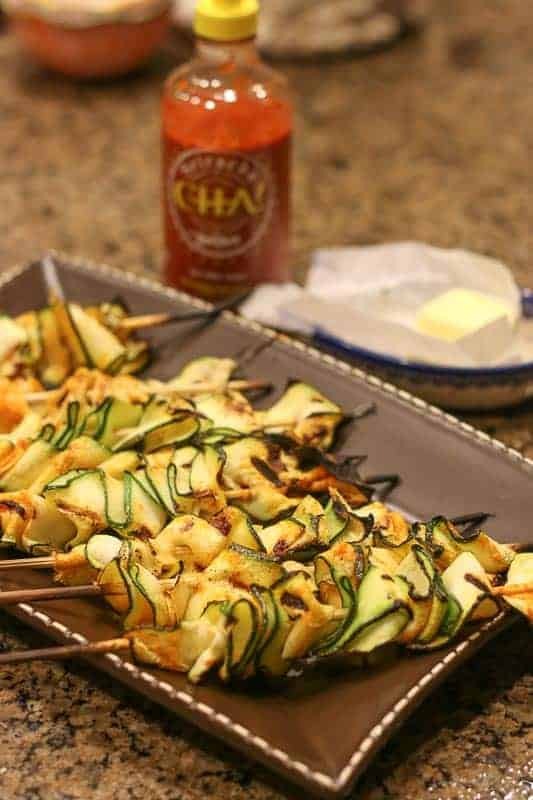 This 3 ingredient Sriracha Grilled Zucchini is low carb, healthy, super easy, and most importantly DELICIOUS!!! 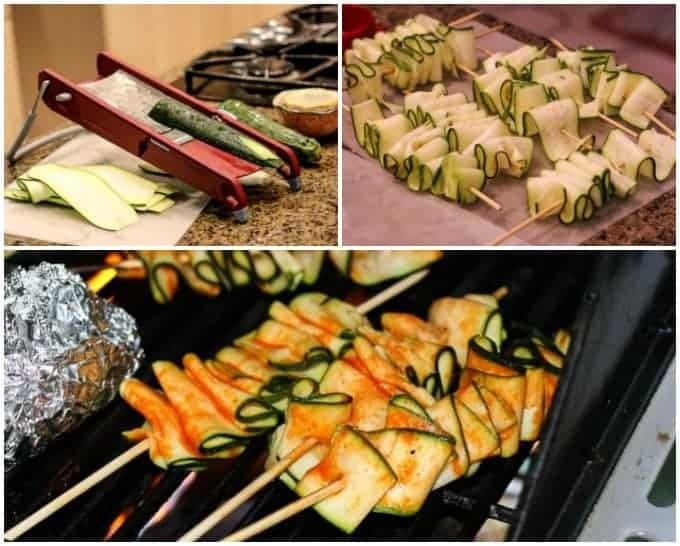 Wow your friends with these fun zucchini ribbons on a stick at your next cookout or add it to your family’s meal as a side dish. This is a recipe you will be making again and again. I have done a lot of cheating in my eating lately. It has been catching up with me around the belly… As they say, “Into the lips and on to the hips.” With my age, it is harder and harder to burn off. I know enough about nutrition and exercise to know better. But sometimes you want a slice of French Coconut Pie or spoonful of Bacon Ranch Potato Salad (never, ever really only a spoonful). The problem is lately my “sometimes” have turned into “often.” I was following Julie Child’s mantra, “Everything in moderation including moderation.” But alas, I am back on track, at least for a little while. I am certainly not promising “forever,” because there is a whole world of food out there I must try, but I am focusing on the healthier stuff until my belly rolls at least stop jiggling. Healthier doesn’t mean we can’t eat good! Oh no! I will never be that person that will eat the strict diet of lean meats and steamed vegetables every day in an assortment of seasonings. No thanks. I will gladly keep my little love handles over that life style. I have to have taste and variety as you can see in my Mussels with Sofrito , Low Carb Moussaka , and Hamburger Soup recipes to name a few. Recently, I had some friends come over for a cookout and wanted to think up something healthy, but really tasty so I didn’t have to stray off my healthy eating. And BAM! I thought of this brilliant Sriracha recipe. It was WICKED GOOD! And I will be making this very, very often. to make zucchini ribbons. It is easy to use and cuts perfectly as you can see below. The red version is a little cheaper than the stainless steal version. I did a lot of research before purchasing it because I do a lot of slicing in my kitchen and I didn’t want another gadget I would be unsatisfied with. I am very happy with it.
. You can use the nice medal ones also. I needed a lot to serve at one time, so I used my wooden skewers. Then you just mix Sriracha and butter together and brush it on the zucchini ribbons and grill them until cooked. They were so good! The Grilled Sriracha Zucchini were gone in minutes with no left overs. Win! Win! So go try them, you will love them! I promise. Do you love spicy food? If you do, you will love this Sriracha Grilled Zucchini. It is an easy 3 ingredients Sriracha recipe that is spicy, flavorful, and healthy. You can serve these grilled zucchini ribbons on a stick as an appetizer or a side dish. Slice zucchini evenly with mandolin. Mix melted butter and Sriracha. Brush Sriracha butter mixture on zucchini. Allow it to marinate about 15 minutes. Look yummy! Love the way you make this recipe. Certainly it is both healthy and delicious, right? Thanks for sharing and have a nice weekend. this recipe is what i’m looking for : easy, healthy and delicious 😀 you right, healthier doesn’t mean we can’t eat good. I must try this out tomorrow dinner. thanks for a nice post. Wow. 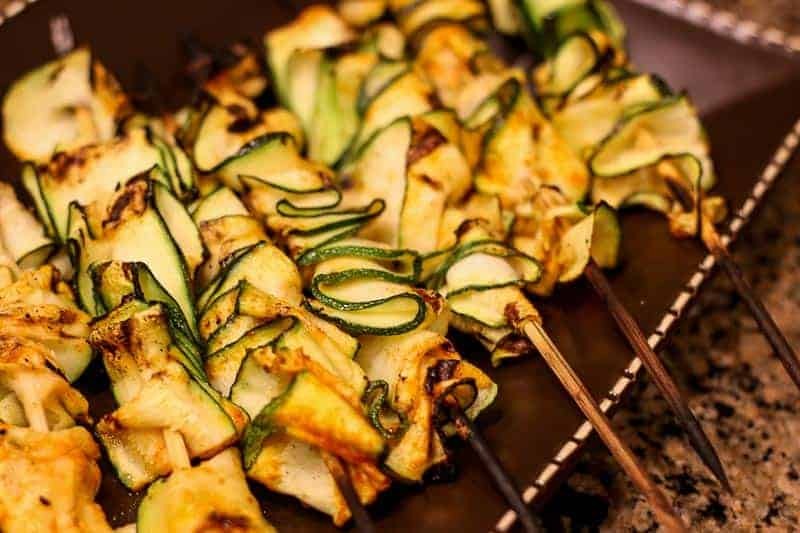 We love grilled zucchini and this looks brilliant! I love anything coated in sriracha so I’m all game! We have so many zucchini right now in our farm CSA so this is perfect. Will try it this weekend with our grilled eats 🙂 Have a great holiday weekend, my friend. I LOVE the idea of skewering zucchini ribbons! I actually have a container full of zucchini, squash, and carrot ribbons leftover from a tart I made and I couldn’t figure out what to do with them. I’m going to grill them on skewer sticks. Thank you!! 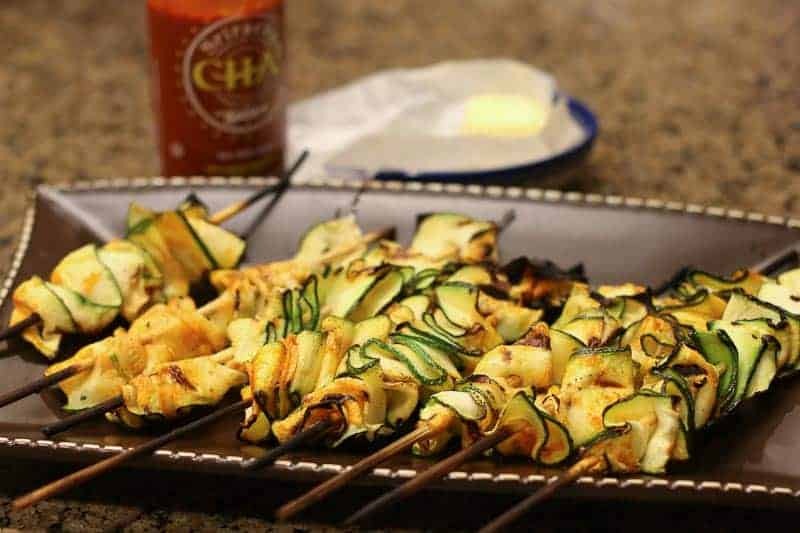 What a great idea – zucchini and sriracha sounds amazing! I have been having zucchini so much this year!! Loving it in everything and yes grilled zucchini are a super delicious side. Have you tried with miso? Love it too! fast, easy, healthy and only 3 ingredients… perfect dish, I love it. Grilled Sriracha zucchini sounds delicious. I need to try it. This looks AMAZING Katie! I love zucchini & siracha & the two together have to be FANTASTIC! This is getting made tonight!